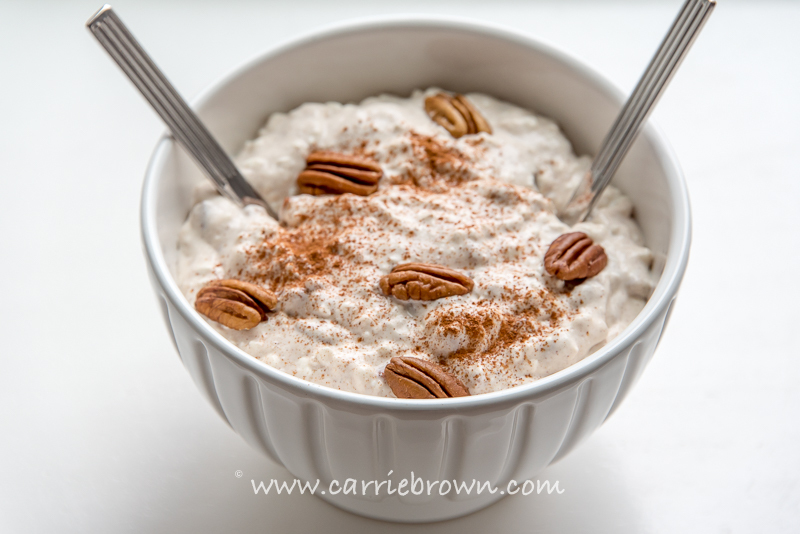 This Cinnamon Pecan Cream is a super easy dish to throw together and can totally hit the spot when you’re looking for a little after-dinner dessert or a cold-cereal type recipe to break your fast. It’s mostly like Rice Pudding without the rice. And I know y’all miss rice pudding. Way back when I would have tossed a big ol’ bunch of raisins in there and called it good. But nowadays I don’t binge on the dried fruit because really it’s just like eating concentrated sugars, and I have found that life and my body all goes a lot better when I’m not fueled by sugars. A couple of unsweetened cranberries in a cookie, or a couple shards of apricots in a cupcake here and there, but that’s it. Dried fruit really adds to the carb situation. These days I’m enjoying toasted nuts in my ‘rice pudding’ just as well. I think you will too. 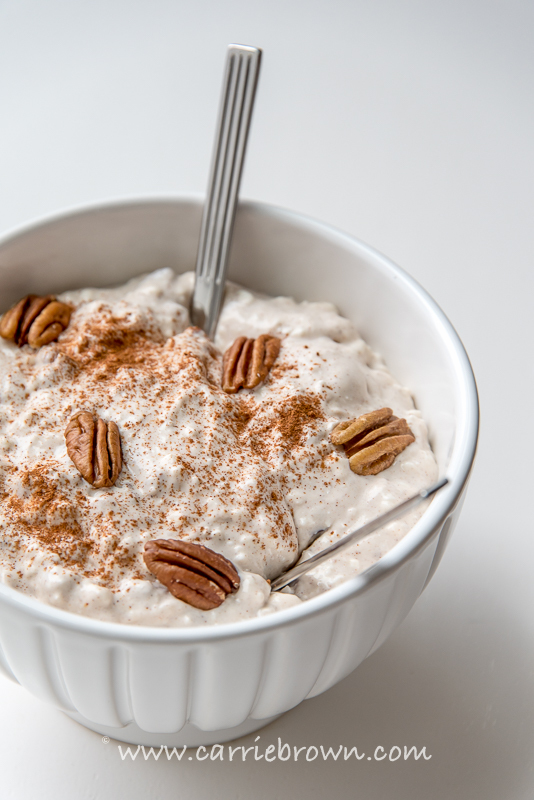 This Cinnamon Pecan Cream is a great way to introduce your wee ones to the delights of dessert that aren’t overloaded with sugars. It feels like dessert, it looks like dessert, and by jove it tastes like dessert. Unlike most desserts though, it doesn’t cause your blood sugar or insulin to go nuts. See what I did there? Oh, never mind. Cinnamon is a great anti-inflammatory, and as long as you’re using Ceylon cinnamon and not Saigon or Cassia cinnamon it’s all kinds of good for you. To learn more about the difference in the two main types of cinnamon and why you should be eating Ceylon, not Saigon or Cassia, this article is a good place to start. When using Greek yogurt, always look for the one that has the lowest sugar / carb content. That might be a non-fat one. But you can always add back in extra fat as needed in the form of mixing in heavy cream. This is what I tend to do as the lowest sugar Greek Yogurt I can get locally is fat-free. So don’t stress about buying low-fat – remember the number 1 driver of ketosis is absence of carbs, not presence of fats. 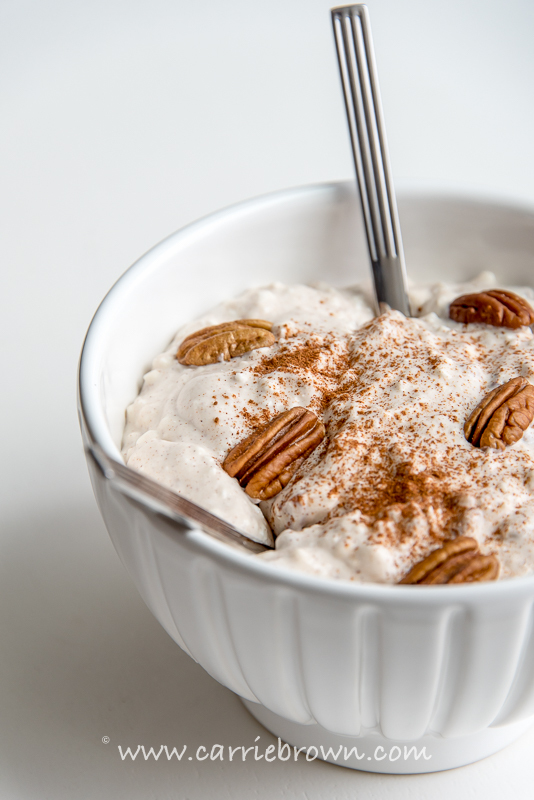 Whatever Greek yogurt you end up choosing, don’t waste any time heading to the kitchen to whip this Cinnamon Pecan Cream up for dessert! Place cottage cheese, yogurt, and heavy cream in a bowl and stir until completely mixed. Add chopped pecans, sea salt, vanilla extract, and ground cinnamon and stir to incorporate thoroughly. Taste and add allulose, xylitol, or erythritol as required for sweetness. Toasted pecans make a significant difference to the flavor and crunchiness of this dish. How to toast nuts. Alter the level of fat and macros by choosing non-fat, low-fat, or full-fat Greek Yogurt and cottage cheese to suit your needs and goals. Yes, you can use whatever nuts you want / have on hand.